Idiopathic pulmonary fibrosis (IPF) is a devastating interstitial lung disease that has no cure. The term fibrosis refers to scarring, in IPF particularly the scarring of the lungs. The scarring causes irreversible destruction and progressive decline of the lungs. When the tissue thickens, the lungs cannot properly exchange oxygen. The term idiopathic, in medicine, means that the origin of the disease is unknown. The exact cause of IPF is unknown, however, certain risk factors such as smoking, exposure to inhaled toxins such as asbestos, lung injury, viral, and bacterial infections, acid reflux and genetics associated with the disease. IPF mainly affects people ages 50 and up. “Many people live only about 3 to 5 years after diagnosis. The most common cause of death related to IPF is respiratory failure” (“What Is Idiopathic Pulmonary Fibrosis? – NHLBI, NIH,” n.d.). “40,000 people die each year to IPF, the same as to breast cancer” (“Facts About Idiopathic Pulmonary Fibrosis | Coalition For Pulmonary FibrosisCoalition For Pulmonary Fibrosis,” n.d.), yet IPF is still an unknown disease to many people. This paper will discuss the risk factors, disease process, complications, management, and new drug therapy clinical trials. Idiopathic Pulmonary Fibrosis first started to become recognizable around the late 1800’s (Noble & Homer, 2005). While currently the exact cause is unknown, there have been several risk factors that are recognized to contribute to the disease. As mentioned above, smoking, exposure to inhaled toxins such as asbestos, lung injury, viral and bacterial infections, acid reflux and genetics are associated with the disease (Noble & Homer, 2005). Smoking accelerates the loss of lung function by destroying the cilia inhibiting the lungs’ natural ability to clean and repair itself (Oh, Murray, & Molfino, 2012). Smoking also damages alveoli, causing poor gas exchange. The chemicals in cigarettes contribute to lung decline and disease and coat the lungs with tar and toxins (Oh et al., 2012). Inhaled substance and toxins such as asbestos are hypothesized to increase IPF probability (Meltzer & Noble, 2008). When toxins invade the lungs, they interfere with the alveoli gas exchange process (Meltzer & Noble, 2008). Lung injury can cause permanent damage. Acute lung injury has been hypothesized to accelerate an underlying progression of IPF. When cells of the lungs are damaged, it can be irreversible (Kottmann, Hogan, Phipps, & Sime, 2009). Viral and bacterial infections cause a build of mucus in the lungs. When the alveoli get clogged they cannot properly exchange oxygen and carbon dioxide. Each infection acquired can cause more damage and can lead to permanent damage. When the lungs lose their ability to exchange gas, oxygen is inhibited from reaching the body’s vital organs (Kottmann et al., 2009). Recent research has found that genetics may play an important role in the risk factor of developing IPF. “Over the past decade, one aspect that has held great promise in helping the medical community to better define the pathogenesis of IPF is the recognition that genetic factors may play a role in this disease” (Lawson, Loyd, & Degryse, 2011). The cause of IPF is unknown. Despite considerable advancement in understanding the progression of IPF, the knowledge of the beginning stages of IPF re still inadequately understood (Noble & Homer, 2005). Originally, in the 1970’s, it was thought that inflammation of the alveoli was the cause (Noble & Homer, 2005). It was believed that untreated inflammation leads to the scarring of the lungs. Anti-inflammatory and corticosteroids were widely used to treat the inflammation. However, those therapies have proven ineffective, making it evident that inflammation was not the cause (Dempsey, Kerr, Gomersall, Remmen, & Currie, 2006). The second theory that came about in the 1980’s suggesting growth termed “alveolar macrophage-derived growth factor” (Noble & Homer, 2005). Known as the ‘growth factor hypothesis’, it is believed that abnormal healing of trauma within the lungs exaggerates the response and growth of profibrogenic causing the scarring of IPF (Noble & Homer, 2005). This theory still proves to be a highly important discovery in the pathophysiology of IPF (Dempsey et al., 2006). A third theory also came out of the 1980’s, known as the epithelial-mesenchymal hypothesis, suggests that tissue death of alveolar epithelial cells can lead to alveolar collapse (Noble & Homer, 2005). The epithelial- mesenchymal cell conversion can alter and change motility and the ability to heal. “Imbalance of the normal homeostatic microenvironment might be, per se, a cause of fibroblast proliferation and myofibroblast differentiation leading to fibrosis” (Prunotto et al., 2012). According to the Coalition for Pulmonary Fibrosis, “Idiopathic pulmonary fibrosis (IPF) is a progressive and generally fatal disease characterized by scarring of the lungs that thickens the lining of the lungs, causing an irreversible loss of the tissue’s ability to transport oxygen. IPF ultimately robs a patient of the ability to breathe”(“Facts About Idiopathic Pulmonary Fibrosis | Coalition For Pulmonary Fibrosis,” n.d.). IPF usually occurs in older adults in their 50’s or 60’s, and tends to occur more in men than in women (Lawson, Loyd, & Degryse, 2011). According to the Coalition For Pulmonary Fibrosis, IPF affects about 128,100 people in the United States, with 48,000 new cases diagnosed annually (“Facts About Idiopathic Pulmonary Fibrosis | Coalition For Pulmonary Fibrosis,” n.d.). “IPF has been reported to occur throughout the world in many different racial and ethnic groups. Studies in the United States have suggested that Caucasians are more likely to be diagnosed with IPF and have higher mortality rates from IPF than African Americans. It is unclear if these findings are due to real differences in racial characteristics or to an under-diagnosis of this condition in minority populations” (Siegel, 2011). IPF symptoms develop over time and usually are not diagnosed until serious damage has already been done to the lungs (“What Are the Signs and Symptoms of Idiopathic Pulmonary Fibrosis? – NHLBI, NIH,” n.d.). Patients are often misdiagnosed with diseases that present similar symptoms such as Chronic Obstructive Pulmonary Disorder (“Facts About Idiopathic Pulmonary Fibrosis | Coalition For Pulmonary Fibrosis,” n.d.). Idiopathic pulmonary fibrosis usually present gradually with a nonproductive cough and dyspnea. (Hyzy, Huang, Myers, Flaherty, & Martinez, 2007). The main symptom patients complain of being shortness of breath (Noble & Homer, 2005). Other common symptoms include: “dry, hacking cough; rapid, shallow breathing; gradual, unintended weight loss; Fatigue (tiredness) or malaise (a general feeling of being unwell); clubbing, which is the widening and rounding of the tips of the fingers and toes” (“What Are the Signs and Symptoms of Idiopathic Pulmonary Fibrosis? – NHLBI, NIH,” n.d.). The physical assessment is an important part of diagnosis, however, symptoms can mimic other diseases and make it hard to differentiate (Meltzer & Noble, 2008). Attention should be paid to key risk factors such as work related inhaled chemical exposure and smoking. Fine inspiratory “Velcro-like” crackles can be heard upon examination and advance towards the upper airway as the disease progresses (Meltzer & Noble, 2008).Clubbing of the fingers and toes is found in 50% of patients (Meltzer & Noble, 2008). Lab results are often inconclusive to IPF, but as part of a puzzle can help to identify the disease. An ABG will more than likely read normal (Meltzer & Noble, 2008). The pulmonary function test (PFT) can lend valuable information to diagnosing IPF. While IPF is a restrictive disease, it can often imitate obstructive disorders or congestive heart failure (CHF) (Meltzer & Noble, 2008). “Routine spirometry reveals decreased measures of forced vital capacity (FVC) and forced expiratory volume in one second (FEV1). The ratio of FEV1/FVC remains normal (or increased) in IPF, consistent with restrictive physiology” (Meltzer & Noble, 2008). Subsequently, the PFT can also reveal reduced TLC, RC, and RV. Reduced gas transfer may also be noted with a DLCO (Meltzer & Noble, 2008). 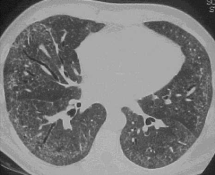 Almost every patient with Idiopathic Pulmonary Fibrosis will have abnormal radiological findings (Meltzer & Noble, 2008). The imaging modality of choice in diagnosing IPF is High-resolution computed tomography (HRCT) (Hospenthal, 2006). “Patchy, predominantly peripheral, subpleural, bibasal reticular opacities, often associated with traction bronchiectasis” (Harari & Caminati, 2005). A phenomenon referred to as honeycombing is a prevalent finding in IPF, seen below is figure 3. 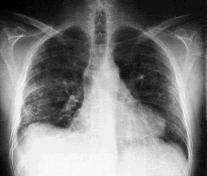 Figure 1: Chest radiograph of a patient with IPF. Chest radiograph reveals peripheral, subpleural reticular opacities, most profuse at the lung bases (Harari & Caminati, 2005). Figure 2: Chest HRCT in a patient with IPF. HRCT shows patchy, predominantly peripheral, subpleural, bibasal reticular abnormalities, traction bronchiectasis and bronchiolectasis and irregular septal thickening. There is also ground glass (Harari & Caminati, 2005). 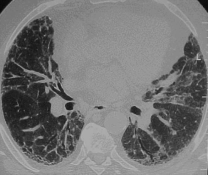 Figure 3: Chest HRCT in a patient with IPF. HRCT shows predominantly peripheral and subpleural fibrosis with honeycombing (Harari & Caminati, 2005). Idiopathic pulmonary fibrosis is a highly progressive disease. Because the tissues in the lungs are scarred, they cannot properly exchange gas and the low amount of oxygen delivered to the body causes several complications and puts strain on the right side of the heart. According to the America Thoracic Society, “There is an increasing awareness of complications and comorbid conditions frequently associated with IPF” (Raghu et al., 2011). Some of the most common complications are: Pulmonary hypertension, cor pulmonale, respiratory failure and lung cancer (Daniels, Yi, & Ryu, 2008). Depression is also often seen in people with IPF because of its devastating prognosis (“Living With Idiopathic Pulmonary Fibrosis – NHLBI, NIH,” n.d.). Acute exacerbations (unexplained worsening of dyspnea) of IPF represent the most destructive and deadly complication (Raghu et al., 2011). “It is presently unclear if acute exacerbation of IPF is simply a manifestation of an unidentified respiratory complication (such as pulmonary emboli, infection) contributing to an acute worsening in a patient with IPF or represents an inherent acceleration in the pathobiological processes involved in IPF” (Raghu et al., 2011). There is currently not a cure for idiopathic pulmonary fibrosis (“What Is Idiopathic Pulmonary Fibrosis? – NHLBI, NIH,” n.d.). Until recently, primary methods of management have been anti-inflammatories and lung transplants (Dempsey, Kerr, Gomersall, Remmen, & Currie, 2006). While Anti-inflammatory are still used today it is not due to the effectiveness of treatment, but lack thereof for alternatives (Dempsey et al., 2006).“Immunosuppressive or cytotoxic agents are used among steroid nonresponders, patients experiencing serious adverse effects from corticosteroids, and patients at high risk for corticosteroid complications” (Harari & Caminati, 2005). “Single-lung transplantation results in an actuarial survival of 73% at 1 year and 57% at 3 years” (Harari & Caminati, 2005). Unfortunately, most patients are not eligible for transplant due to age or comorbidity factors (Harari & Caminati, 2005). In the spring of 2014 the FDA announced two new drugs for the management of IPF (“CPF Celebrates Historic Year of Progress in Pulmonary Fibrosis | Coalition For Pulmonary Fibrosis Coalition For Pulmonary Fibrosis,” n.d.). Ofev (nintedanib) and Esbriet (pirfenidone) were both shown to slow the progress of IPF in clinical trials. “Pirfenidone is a transforming growth factor-beta inhibitor and tumor necrosis factor-alpha inhibitor” (Gohil, 2015). Ofev is a “fibroblast growth factor receptor (FGFR) antagonist, platelet-derived growth factor receptor (PDGFR) antagonist, and vascular endothelial growth factor receptor (VEGFR) antagonist” (Gohil, 2015). The two treatments are still in the early stages with little known about their effectiveness. Prognosis for IPF is dim. It is a fatal disease (Meltzer & Noble, 2008). The median survival rate is 3 years after diagnosis (Peljto et al., 2013). Factors associated with “shortened survival time include: older age, smoking history, lower body mass index (BMI), more severe physiologic impairment, greater radiologic extent of disease, and the development of other complications or conditions, in particular, pulmonary hypertension, emphysema, and bronchogenic cancer” (Ley, Collard, & King, 2011). (“Active Clinical Trials and Investigational Research in IPF | Coalition For Pulmonary FibrosisCoalition For Pulmonary Fibrosis,” n.d.). "Idiopathic Pulmonary Fibrosis: An Overview." UKEssays.com. 11 2018. All Answers Ltd. 04 2019 <https://www.ukessays.com/essays/nursing/idiopathic-pulmonary-fibrosis-overview-8541.php?vref=1>. "Idiopathic Pulmonary Fibrosis: An Overview." All Answers Ltd. ukessays.com, November 2018. Web. 22 April 2019. <https://www.ukessays.com/essays/nursing/idiopathic-pulmonary-fibrosis-overview-8541.php?vref=1>. UKEssays. November 2018. Idiopathic Pulmonary Fibrosis: An Overview. [online]. Available from: https://www.ukessays.com/essays/nursing/idiopathic-pulmonary-fibrosis-overview-8541.php?vref=1 [Accessed 22 April 2019]. UKEssays. Idiopathic Pulmonary Fibrosis: An Overview [Internet]. November 2018. [Accessed 22 April 2019]; Available from: https://www.ukessays.com/essays/nursing/idiopathic-pulmonary-fibrosis-overview-8541.php?vref=1.